Easystay Studio Apartments are all located in the heart of colourful St Kilda. This is one of Melbourne's most exciting areas. Luna Park, St Kilda Beach, and an eclectic array of restaurants, cafe's and bars are all within easy reach. Easystay Studio Apartments are at 4 locations within St Kilda. 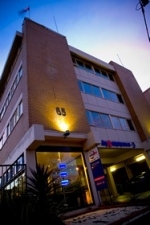 Check in for all Apartments is at the Easystay Reception situated at 63 Fitzroy Street, St Kilda. All Apartments are allocated upon arrival, whereby you will be given the location and address of your Studio Apartment, which is nearby to the Easystay Reception. Reception is open daily between 7 am to 11 pm. After hours arrivals please use courtesy phone outside the Easystay Reception for express check in. All Apartments include kitchenette facilities including fridge/freezer, microwave, crockery and cookware, remote control colour tv & personally controlled heating/airconditioning. Car parking charge is $10 per night per car and is subject to availability.